Just a stones throw from the Redwoods Forest and some of the world’s best Mountain Biking trails, this spacious open plan modern home provides all you need for a Relaxing Getaway or an adventure packed visit. Perfect for adventure travellers with toys - the double garage has internal access and great lockable storage for mountain bikes. - Two decks off the kitchen/dining area facing east or west to catch morning or evening sun, outdoor dining and a BBQ. - A grassed area off the largest bedroom with outdoor beanbags to sit under the shade sail and enjoy the beautiful garden. - A huge open plan lounge with smart TV, and a large master bedroom at the back of the house set up for kids to keep the noise away from the adults. Downstairs there is a massive double garage with internal access so guests can tinker on bikes/cars and boats at their leisure. All mod cons including Wifi are included. There is a fireplace and wood provided or save time and switch on the heat pump to heat or cool. A cot and highchair are available to make it hassle free with kids. The kitchen is marble with a new gas hob, electric oven, plenty of top quality cookingware and a Nespresso machine (bring your own pods). Pets are allowed if kept off furniture (dog bed provided). The house is less than 1km from the Redwood Forest and world famous mountain bike tracks, a short drive to the stunning Tarawera, Blue and Green lakes, fishing, hiking, sightseeing, boating, rafting and horse riding. The perfect location no matter what you are looking to do during your stay! The house is located within walking distance of a number of parks, the Lynmore Tennis Club, a convenience store, boutique cake shop, the Redwoods Centre with organic produce/supplies, butcher, fishmonger, liquor store, and top physio for those MTB injuries. Added to this the Outdoorsman Headquarters is only a short walk featuring cafes, a bakery, fruit and vegetable shop, sushi, fish and chips, kebab shop, Burger Fuel, hair and beauty, medical centre, pharmacy and more! We are situated less than 10 kms from the airport and 5 km to the city centre. 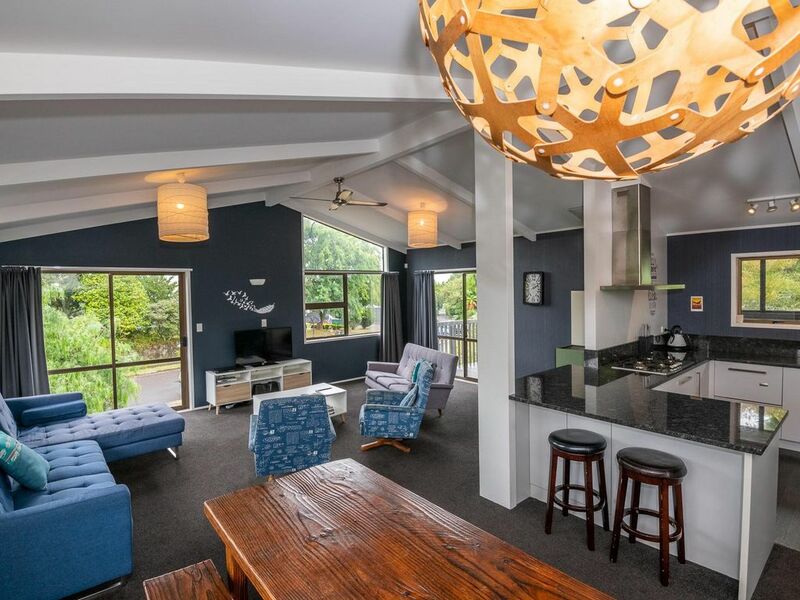 A comfortable home close to Rotorua and all its adventures. A group of us stayed at 'As you do retreat' for a mountain biking weekend. The house was great for a larger group of people with a good sized living area and plenty of beds. There is ample garage space for bikes and the spa was an added bonus to soak weary legs. Great location near the entrance to the Redwoods so no need to pack the car everyday. Thanks for having us. The wheelie bins were full and there was rubbish/bottles piled up on the side of the bins on our arrival. There are a lot of ants everywhere. The couch is flimsy and not in very good condition. Nice place and well set up. As You Do is in a good location and was well suited to our needs. The modern kitchen was great and the living areas were comfortable and well set up. The spa was nice and barbeque was useful on some hot days. Our only suggestions would be to provide some barbeque tools especially cleaning ones to make that easier and to fix the side door so access to cleaning the bikes was easier. Fantastic location. Perfect for one or two families with everything you need for a relaxing weekend away.